When you access the Advanced Scheduling tool, the Recurrences tab options allow users to define how often to distribute the schedule. 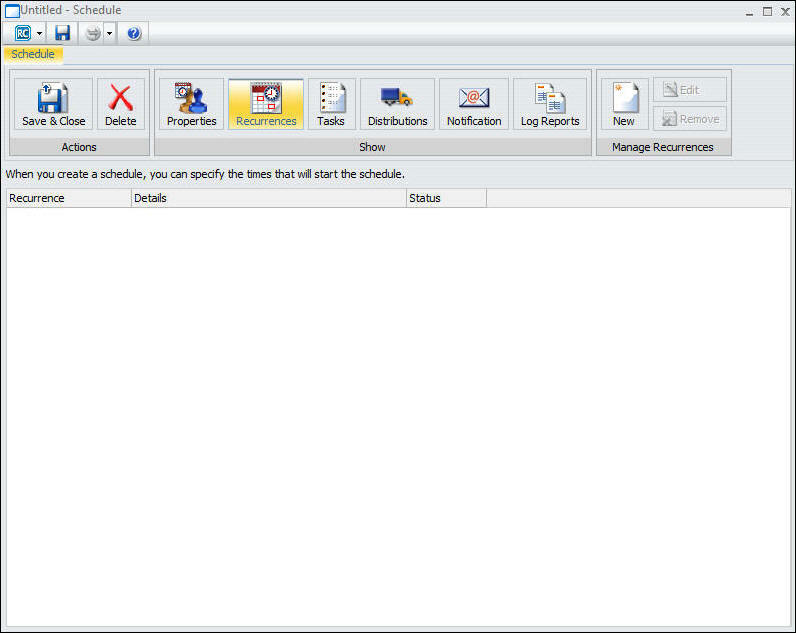 The following image displays the Recurrences tab in the Scheduling tool. To create a recurrence, select the New option on the ribbon. The Schedule Recurrence dialog box displays, as shown in the following image. You can assign start and end times by selecting the arrow to the right of the date value. When you click on the arrow, a calendar will display that enables an authorized user to set the date for schedule distribution. Use the up and down arrows to set a specific time for schedule distribution. Alternatively, you can enter the time manually. To run the schedule within the selected interval, check the Repeat schedule every check box to enable Advanced settings options. Set how often you want the schedule to repeat. The Until Time option specifies the time of day to end repeating the schedule. The Last For option specifies the amount of time to repeat the schedule. Enter this information manually or use the up and down arrows to set parameters. For more information, see Advanced Settings.